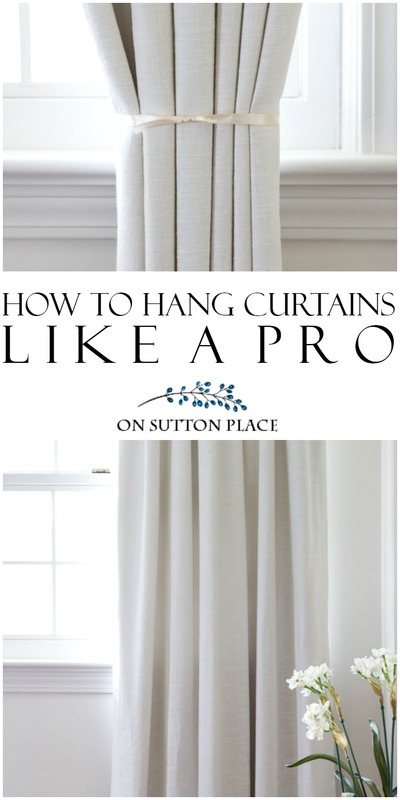 How to Hang Curtains like a Pro! 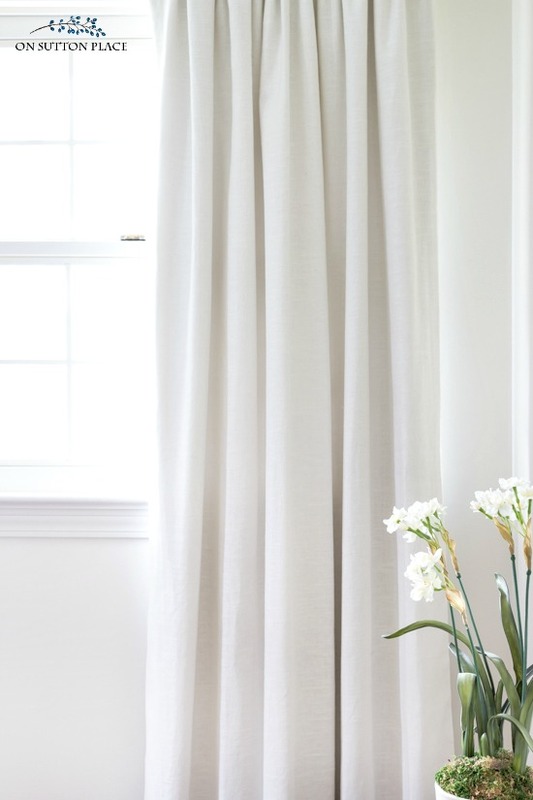 How to Hang Curtains Like a Pro! | Easy tips and tricks to get a custom look with ready-made window treatments. Anyone can do this! 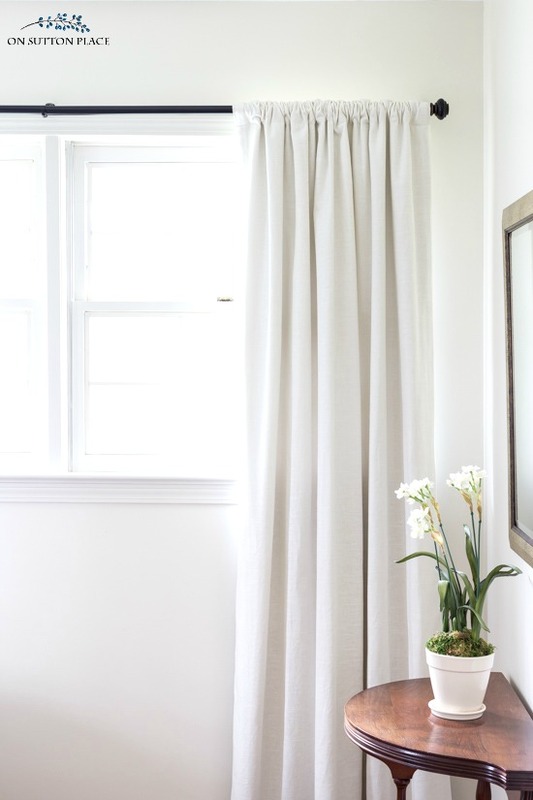 Today’s post is called How to Hang Curtains Like a Pro and is one I’ve wanted to share since the beginning of my blog…but never had the opportunity until now. 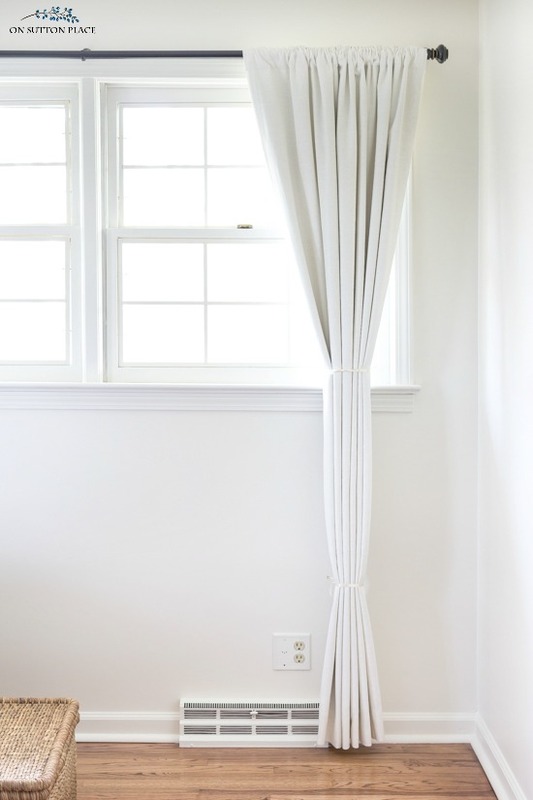 I’ve used this method to hang curtains since I saw it in a magazine years (and years) ago. It’s easy and works every time! 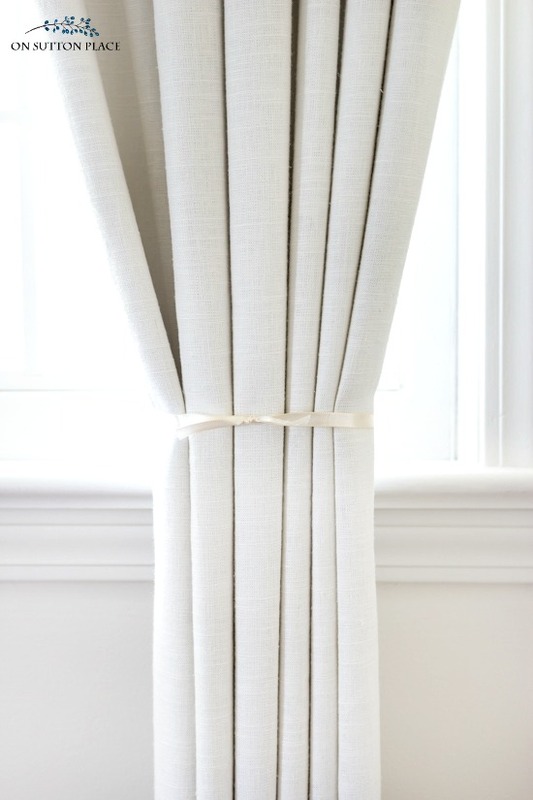 Before we get started I want to explain that this post doesn’t get into choosing curtain panels or hanging the rod. That’s definitely not my area of expertise! What I am good at are finishing touches and that is really what this post is about. Taking a ready-made item and making it look custom…and devoting a few extra minutes in order to take a design element to the next level. First thing to do is, of course, hang your rod. The next step can be accomplished in two ways. 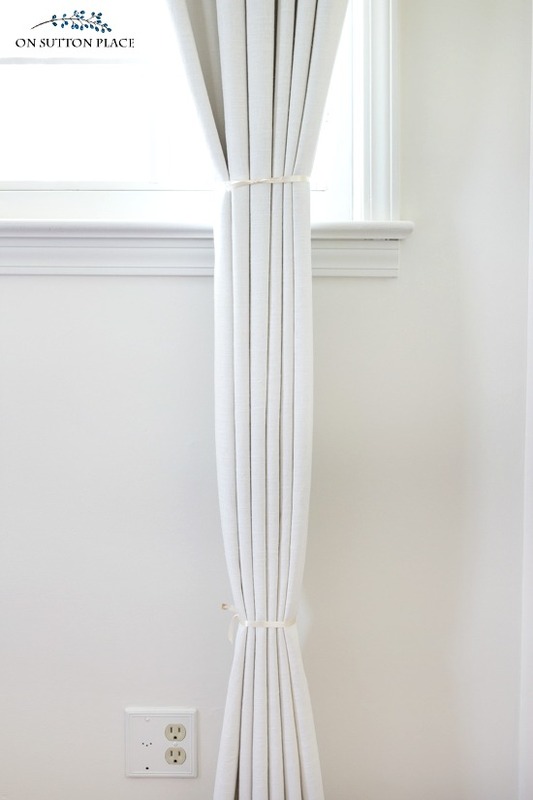 You can iron your curtain panels and then place them on the rod. Sometimes this method can be time consuming and if your panels are long, they end up with wrinkles even after ironing. My preferred method is to hang the rod, hang the curtains and then use a steamer to erase the wrinkles. 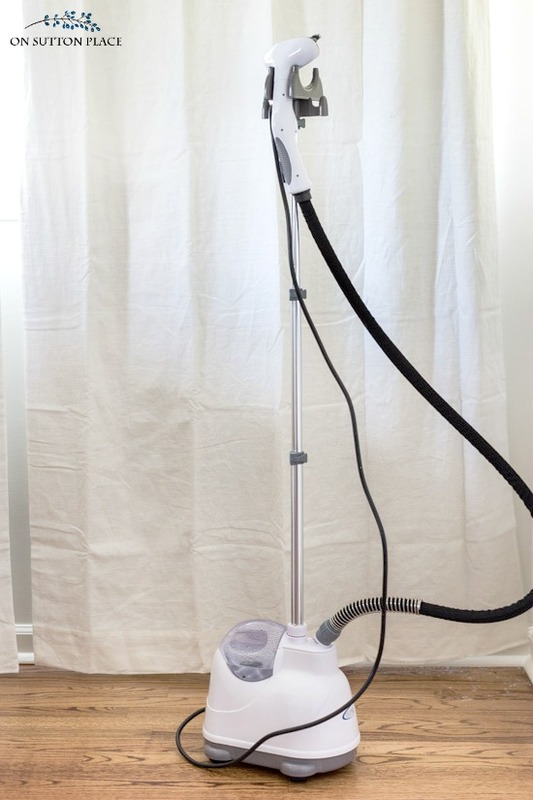 This is the steamer I used and I must say it is pretty slick. It heats up almost immediately. I steamed 6 curtain panels and only had to fill the water tank once. A hand steamer would work as well but may take a little longer. The next step is to cut pieces of ribbon or string about a yard long. If you are hanging long panels, you will need 2 strings per panel. Now gather the curtain panel and with both hands, make pleats. It may take a few tries to get the size of the pleats correct. You will want both the left and right edges of the panel to be facing the window. When your pleats are how you want them, loosely tie a piece of ribbon/string around the middle of the panel. Follow the pleats down with your fingers and tie another piece of string towards the bottom of the panel. Now is the hard part. For best results, leave the ribbons on for a week. You can take them off sooner, but a week will give you nice, neatly hung window panels. After removing the ribbons, you may have to get out the steamer and touch up the area around where the ribbons were tied. I had to do that for a couple of my panels but the others were just fine. Our home has two guest rooms and they were both a sorry mess and stuck in the 90’s. We emptied them out completely and started from scratch. We had the original hardwood floors refinished and everything was painted. These are the window panels I chose for both rooms. 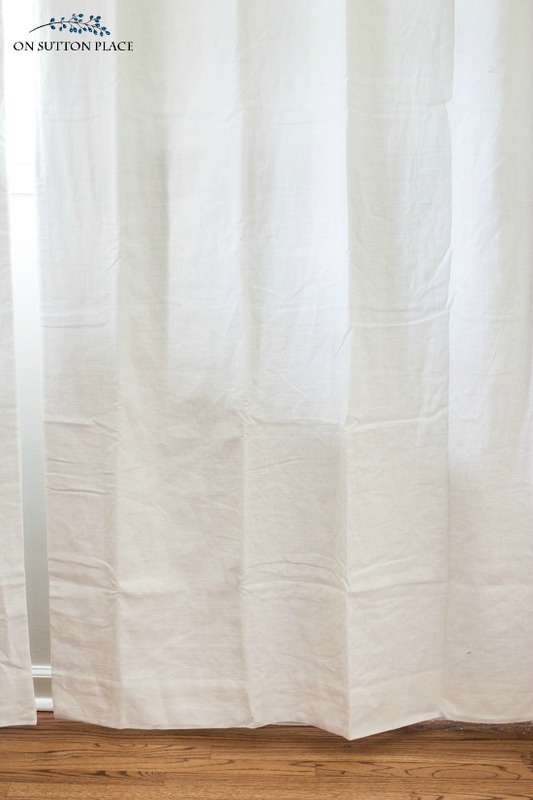 They are Emery Linen/Cotton Pole Pocket Drapes in ivory from Pottery Barn. I got the version with the black-out lining so the rooms would be dark in the morning since they face the east. I am really pleased with the way they turned out. It’s been years since I purchased ready-made panels because I almost always make my own soft furnishings. This time I took the easy route and was not disappointed. 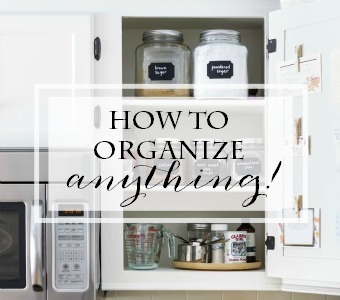 Click the images below for more Homekeeping tips! This helped me decide whether to buy a steamer!!! This may sound a little obsessive but a technique I read about online helps with keeping the folds in the place especially if the window is open and blows the panel around a bit. I thread some wide wire-edged gift ribbon in the hem of the panel. Then I shape the folds and the wire of the ribbon keeps the fold in place. This is especially helpful for heavier thicker panels that you don’t move daily and are just decorative. Did you use clips or the rod pocket? Do they come with both type of headings? I used the rod pockets but you can use the clips too. Same heading for both! 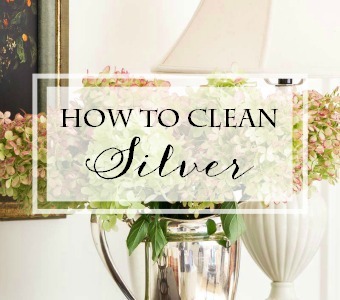 Be very careful when using your method for cleaning silver as it can cause permanent damage to your sink. I would say use an old pan or container that can be stored away until you need it again. 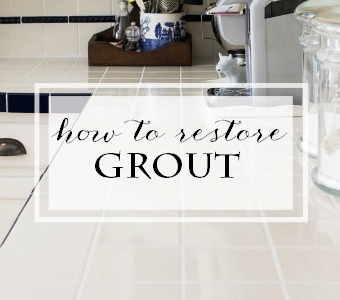 I had some pitting and damage to the drain part of my sink when using this method. Just a heads up for those of you who might have a stainless sink. Did you redo the other guest room? Have we seen it? Great idea for getting the curtains to hang straight. Thanks! Yes. I renovated two guest rooms. I haven’t shown the second one on the blog because it’s not completely finished. Hopefully some day! This is a very helpful post for a couple of reasons. I have been wondering if steamers really work, but you make me want to try one. Also, like you, I usually make my own curtains, pillows, etc. But I am finding some good options at stores like Homegoods or TJ Maxx. The price isn’t much different (fabric isn’t cheap) and I find I like the look of a solid color these days (so easy to find ready-made curtains in solid colors). But this tip will help those ready made curtains look custom. Thank you! They look beautiful and the way you did them is a great idea!! Nice tip!!! I might need to get another steamer…I kinda trashed mine after using it on removing wallpaper -_- lol! The curtains look beautiful:) Anxious to see your updates on the rooms!!! Your drapes look great! And thanks for the tips. Thank you so much for this tip. I know what you mean when you say the older you get the longer it takes you, I have slowed down so much I think at times I’m going backwards. Interesting, I would never have thought of this. I haven’t had curtains in a long time, I have had plantation shutters and roller shades in my last two places. I will be adding curtains in this place and I will use this tip for sure! Your curtains looks so very nice. Fortunately the two rooms I am adding them in are guest rooms, so it should be no problem for me to leave them tied for the soft pleats to set in. I’ve used this technique for years. Works like a charm! Thanks for these timely tips Ann. I just made curtain panels for my guest room and living room and was wondering how to get them to hang pretty. How timely! I’ve just bought a new pair of curtains and have always gone down the ironing board route. Steaming whilst hung sounds like a much more efficient method and I love this idea for creating a much more professional looking finish. Thank you, Ann! Wonderful idea Ann! I can sew and have a Jiffy Steamer like you. I just love your blog! Great, easy ideas you have, too! Very talented! Thanks Ann for the great tips! I know I can do this. What a great tip, Ann! I have quite a few ready made Pottery Barn drapes in our house and I’m getting ready to send them to the cleaners (a few at a time!) I hope they come back with nice pleats in them, but if they don’t, now I know how to get them! I have no curtains in my home but this is excellent to keep on hand for when I do or if I am helping a friend with theirs. Those steamers are so handy, ironing curtains are a pain in the patoot. I, too, usually make my own soft furnishings but sometimes the trade off in saving time is worth the cost difference and many times you can find ready made less expensive. Love this. I do drapes for my dollhouse and it is quite difficult to get my hands in the houses to get good soft pleats. I am going to try this for my dollhouse curtains. I’ll let you know how it works. I used your tips for the living room rug. It looks good. Your drapes look gorgeous. How do you open and close them? That’s a problem I haven’t be able to figure out. I purchased the drapes with the large grommets from Country Curtains and they slide open and closed but yours are plain on the top. Yours are the type I want to get in my bedroom but can’t figure out how you open and close them easily. I’d be very grateful if you would let me know the method. Hi Margo! I just reach up and slide them open or closed. There is a generous rod pocket so they are easy to move. I recently bought a steamer to use for my PB Emery drapes but they didn’t turn out like yours. I’ll try again and tie them with ribbon. Thank you for sharing this tip. By the way, I received the Heritage flannel sheets from LL Bean for Christmas. My husband and I love them – so cozy. Enjoy your day! Great tips, very clever and helpful, and I love the curtains! Brilliant idea on how to use the ribbon. I have an industrial steamer and used it all the time in my other home but haven’t used it in the cabin. I will have to get it out again. Thanks for the reminder. So clever and simple! Thanks for your timely post as I’m finally getting around to hanging a pair of curtains in our little bedroom. I have never seen the above technique of creating pleats, but it’s so simple and pretty! Thank you for sharing and I can’t wait to see what you have done to your extra bedrooms. I am so pleased you posted this! I especially like the way you made the soft pleats. How clever! You always have such wonderful tips and tricks, Ann! Thanks and Happy New Year! !